It is mid-March in Chennai, India when I arrive with my group of young actors from Boston to tell the story of the 1984 Delhi massacre. Chennai is a city that I have strong ties to. During a previous life, after being bitten by the entrepreneurial bug, I had quit the US tech behemoth that I then worked for to work for a small software company based in Chennai called Futuresoft. Over the next two years, I spent a lot of time in the city as I helped re-engineer the company and position it for growth, leading to its eventual acquisition. I developed many friendships and had some very fond memories of the city. The Chennai performance of the play has been organized by a friend from my days as an undergraduate at Birla Institute of Technology & Science (Rajasthan, India), Ravin Kurian, who had been following the fortunes of ‘Kultar’s Mime’ on Facebook and had offered to help bring the production to Chennai. 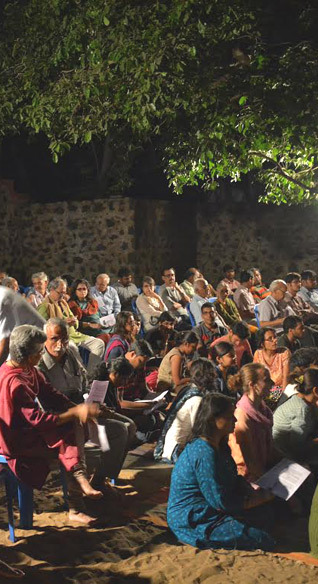 Our host in Chennai is Sadanand Menon, a well-known journalist, arts editor, teacher of cultural journalism, photographer, stage lights designer and frequent speaker at seminars on politics, ecology and the arts. Sadanand has been a close associate of the legendary choreographer and dancer, Chandralekha and he has graciously offered us a beautiful venue called Spaces that had been conceived by her, which he now oversees. Sadanand, as it turns out, has a strong connection to the events that unfolded in Delhi in October 1984. Quite by chance, he happened to be in Delhi when Mrs. Gandhi was assassinated. He proceeded to take many photographs of the carnage, which were commandeered by various inquiry commissions into the violence that had been seated in the last thirty years. Unfortunately, none of his photographs were ever returned to him. Sadanand welcomes us to Spaces, which is a serenely beautiful venue on the outskirts of Chennai, right on the ocean in Basant Nagar. It is an open air theater, surrounded by palm trees and foliage with a sand floor. As we prepare for the performance, a soft ocean breeze blowing, I feel almost like I felt in Preet Nagar (a small village in the Punjab, once home to a utopian commune of brilliant Punjabi writers, poets and artists) as my imagination conjures up the spirits of artists and their muses past. Sadanand is a warm and wonderful presence who makes us feel very welcome. We are far from the city and it is Thursday evening. I am convinced that our audience will consist of Ravin, Sadanand and perhaps a half dozen of their close friends. As night falls and the breeze becomes stronger, a crowd begins to form in the foyer. I see some familiar faces but there is a sea of humanity out there, waiting to be seated. ‘Spaces’ is completely full! There is not even any standing room left. Tonight’s performance is one of our most memorable. Perhaps the cast is inspired too, by the unexpectedly large audience and the spirits that inhabit this beautiful place. Some of my heroes are in the audience today. Teesta Setalvad is a well-known Indian Civil Rights activist and journalist. She runs the Citizens for Justice and Peace, an organization she created to fight for justice for the victims of sectarian violence in Gujrat in 2002. She and her husband, Javed Anand, a journalist and activist have been constantly harried and harassed by powerful politicians in India, who have a vested interest in blocking their quest for justice and transparency. It is an honor for the ‘Kultar’s Mime’ team to have Teesta Setalvad and Javed Anand in the audience today. During the talkback following the performance, I sit back and listen to her speak. At other talkbacks, I have often made the point that the stories of all the innocent victims of sectarian violence are connected. Today her presence makes that connection palpable. The moderator of our talkback is Sashi Kumar. Several years ago, just as my involvement with Futuresoft was winding down, I remember reading a story about a film on 1984, called ‘Kaya Taran‘, which had been made by a Chennai based filmmaker, tucked away in an obscure corner in one of the Chennai papers. The subject of the film immediately piqued my interest. Based on a short story called ‘When Big Trees Fall’ by N.S.Madhavan, it told the story of a young Sikh mother and her child who seek refuge in a hospice for dying nuns in the provincial town on Meerut, fleeing a bloodthirsty mob that has attacked and killed the rest of their family. The film, by virtue of its subject matter, was never going to be a Bollywood blockbuster and sure enough it faded into obscurity, despite winning the prestigious Aravindan Award. I had been able to acquire a DVD of the film thorough the efforts of one of my Chennai lieutenants and was completely blown away by the sensitivity with which the subject of the 1984 pogrom had been handled. ‘Kaya Taran’ is a fabulous film and truly deserves to be seen widely. It was one of the works of art that the Kultar’s Mime cast engaged with during their dramaturgical work and it is not an exaggeration to say that their work on the play has been informed by this extraordinary film. The filmmaker was none other than Sashi Kumar, who is well known for having stared ‘Asianet‘, one of India’s first regional satellite channels and founding the Asian College of Journalism. When Ravin had first connected me to Sadanand Menon, I had asked him if he knew Sashi Kumar and learned that he knew him extremely well, which should not have come as a surprise, given the prominent place that they both occupy in the Chennai arts scene. I asked for an introduction and proceeded to invite him to the Kultar’s Mime performance in Chennai. Emboldened by his ready acceptance, I asked him to moderate our panel after the performance and I was absolutely thrilled when he agreed. It is such a treat to have Sashi Kumar as our moderator. His own sensitive engagement with 1984 informs his introductory remarks. The conversation with the audience is wide ranging, embracing subjects as broad as the causes of the violence and very technical theatrical aspects of the play. An elderly gentleman even attempts to somehow blame the Sikhs for being attacked in 1984, suggesting they ‘brought it upon themselves’ by emphasizing their separateness from the Hindu fold, a specious argument that I politely but firmly debunk to resounding applause from the overwhelmingly non-Sikh audience. My mind is in a whirl. Here I am in Chennai, far from the Sikh homeland, Punjab, talking about the pain of the Sikhs. With me is a brilliant filmmaker who has beautifully told a story that epitomizes ‘embracing the pain of the other’, which is a theme writ large on Kultar’s Mime. A few feet from us sits a Hindu woman, who has bravely set out on a quest to seek justice for the Muslim minority of Gujarat, which was set upon and victimized in the 2002 carnage. All of a sudden, for a wonderful moment, everything that Kultar’s Mime has tried to accomplish through this journey becomes very real. I feel a rush of exhilaration, compassion and humility, all at once. I cannot leave Chennai without acknowledging the ghost of Chandralekha, for she is our true host tonight. We sit in the beautiful and serene place that she created. Surely she is here too, looking down benignly upon us. My thoughts drift to ‘Kaya Taran’ again and the dramaturgical phase of Kultar’s Mime. One of the most powerful moments in the film is a stylized dance, eerie in conception, executed brilliantly by Navtej Singh Johar, the well-known Sikh exponent of Bharat Natyam, an ancient South Indian dance form, with a group of female dancers. The dance has stayed in my mind ever since I first saw the film a decade ago and prompted much discussion during our dramaturgical work. It is beautiful, yet very disturbing and it comes at one of the most traumatic moments in the film. It is surreal. It turns out that the dance was choreographed by none other than Chandralekha! ‘Kultar’s Mime’ is available for sale all over the world on Amazon. Anyone who attended the play can email kultarsmime@giaea.com to receive a discount code by mentioning the performance they attended. 1: Sangat Singh (Kuala Lumpur, Malaysia), April 30, 2016, 1:05 AM. Sarbpreet Singh ji, each line you write adds to the indictment of that black period of Indian history, to stay for all times to come. It will never go away, and then you have Kultar's Mime to add to the shadows that would walk with them for ever. Worth noting: when Mohandas Gandhi was shot, he was deemed not to amount to a 'big tree that shook the earth'. 2: Sarbpreet Singh (USA), April 30, 2016, 10:46 AM. 3: Sangat Singh (Kuala Lumpur, Malaysia), April 30, 2016, 4:05 PM. Sarbpreet Singh ji, would love to meet you when you come to Kuala Lumpur. Will communicate with you to see you at the first available opportunity. 4: Dya Singh (Melbourne, Australia), May 01, 2016, 2:46 AM. Sarbpreet ji's mention of dates in Malaysia makes me want to come to Malaysia just to see Kultar's Mime all the way from New Zealand. I hope we do get it to Australia too. We must always be reminded of what happened in the 1984 Holocaust. No one will be able to take that away from us. 5: Sangat Singh (Kuala Lumpur, Malaysia), May 01, 2016, 5:26 PM. Dya ji, your indication that you might show up in May to see Kultar’s Mime has opened a floodgate. It took me to Guru Nanak’s expression of extreme distress at the indiscriminate murder and plunder of Saidpur with the express sanction of then the rulers. Kultar’s Mime is a synopsis but nothing like Guru Nanak’s ‘Babar Vani’. Dya ji being a music director of note, he could possibly suggest adding a sound track of Guru Nanak’s “aytee maar pa-ee karlaanay tain ki dard na ayaa" [GGS:360.13]. “With so much of slaughter and suffering, O Lord, didn’t you feel compassion?" Sarabpreet Singh ji, we have to meet when you come to Kuala Lumpur and now with the prospect of Dya Singh ji joining, to perhaps further enhancing ‘Kultar’s Mime’. We hope it also becomes the longest ever captivating play since “The Mousetrap”. Kultar’s Mime in Chennai, India"